Happy Wednesday! Hope everyone’s having a great middle-of-the-work-week day! A bit of good news for today; we’re less than a week away from the Presidential Election and no more political ads. If that isn’t reason enough to celebrate I don’t know what is! At any rate, I’m here today to share a fun card. It’s a bit of a wishing card today. Our unseasonably warm and dry fall here in Colorado has me wishing for snow. Normally, we get snow before my Birthday in October. Not only did we not have any snow, we haven’t even had any rain. So, I’d like to think of my card as a snow dance card. I thought maybe if I made a snow themed card we might actually get some snow. On the upside, it also means that I got my first holiday card of the season done. Check! To create the card I die cut the background panel of snowflakes out of some shimmery white cardstock. I glued that to a piece of lighter blue cardstock that I’d sponged some darker blue around the edges of for a bit of shading. I stamped a few of the gorgeous snowflakes from the Dare 2B Artzy Snowflake Wishes set and heat embossed them with some really pretty Clear Gold embossing powder onto some powder blue cardstock. Once my snowflakes were embossed, I fussy cut them out and placed them on my card panel with some dimensional foam. I die cut a couple of fishtail flags and embossed the sentiment Seasons Greetings from the Snowflake Wishes set onto one and layered it onto another fishtail flag cut from some pretty sparkly blue cardstock. Everything was adhered to a darker blue piece of cardstock and put into my card front. I added some blue gemstones to the center of the Dare 2B Artzy snowflakes as well as my die cut background. So here’s hoping that my card will bring about some snowy days for us soon. Hope you enjoyed my card today and get some inspiration for starting your own holiday cards. 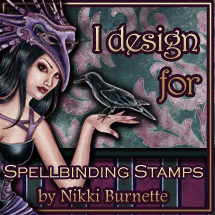 Dare 2B Artzy has a lot of great stamps and papers for all of your holiday card needs. You can find all the seasonal & holiday stamps here and the gorgeous new holiday cardstocks here. Be sure to check back with the Dare 2B Artzy blog this weekend for the latest on the new challenge for November. You won’t want to miss it!